A grandmother from St Lucia whose application for leave to remain in the United Kingdom on the basis of her private and family life was dismissed as “clearly unfounded” has successfully challenged that certification, meaning she will be able to appeal from within the UK. A judge in the Court of Session reduced the decision after ruling that the decision letter failed to take into account the “best interests” of the petitioner’s grandchild in considering her claim under article 8 of the European Convention on Human Rights (ECHR). Lady Wise heard that the petitioner “MSA”, a 66-year-old citizen of the Caribbean island of St Lucia, arrived in the UK in 2009 on a six-month visitor’s visa, but overstayed and in July 2016 she was served papers indicating that she was liable for removal from the country. She submitted an application to be permitted to remain on the basis of her private and family life in the UK, but the Secretary of State for the Home Department decided to refuse her application and certified her claim as “clearly unfounded”. The petitioner lodged a petition for judicial review seeking reduction of that certificate, as otherwise any appeal against the substantive decision must be brought from outside the UK. The court was told that the petitioner had lived with her daughter and son-in-law, who have indefinite leave to remain in this country, since her arrival in the UK in 2009. The petitioner’s daughter, who is in full-time employment and her husband, who serves in the Armed Forces, had a son together, who was born in September 2013. The petitioner was said to enjoy a very close relationship with her daughter and son-in-law and with her grandson with whom she lived in a core family unit, and acted as “primary carer” for the five-year-old boy while his parents went to work. This was the primary basis for her claim for leave to remain, but in a decision letter of 23 August 2017, the petitioner was informed that her application did not fall within the family life rules under Appendix FM of the Immigration Rules as her claim did not involve a partner, parent or dependent children in the UK. The letter stated the respondent had taken into account the best interests of the child in considering whether there were “exceptional circumstances” which would render removal an unjustified breach of article 8 ECHR, but concluded that her claim was clearly unfounded because, “while you may provide care for your grandchild while their parents are at work, you have provided no reason why this could not be done by the parents by adjusting their work patterns or by using the services of a nursery or childminder etc”. On behalf of the petitioner it was submitted that the Secretary of State failed to consider the facts carefully and decide what weight should be given to a relationship that on the face of it “justified article 8 protection”. It was indisputable that section 55 of the Borders, Citizenship and Immigration Act 2009 applied such that the decision must have as a primary consideration the need to safeguard and promote the welfare of any children in this country. There was clear authority that when the Secretary of State considered this case the requirement was to analyse all of it, not just to “cherry pick” the adverse factors in looking at what the child’s best interests required and ask whether those requirements were outweighed by the legitimate aim of immigration control. The problem with the Secretary of State’s decision was that it ignored a number of factors, and appeared to attach “no weight” to the petitioner’s important role in the child’s life. Accordingly, it was argued that the child was “effectively invisible” in the decision and the requirements of section 55 had not been complied with. But on behalf of the respondent, it was submitted that the Secretary of State had not erred in the decision to certify the petitioner’s claim as clearly unfounded. It was said that regard must be had to the consideration that the maintenance of “effective immigration control” was in the “public interest”, and that in cases involving a family life established when the immigrant is in the UK unlawfully or temporarily, a “very compelling” claim was required to outweigh the public interest in immigration control. Reducing the decision to certify the petitioner’s application for leave to remain in the UK as clearly unfounded, the judge ruled that the Home Secretary had made a “material error” in her approach to the family life claim. 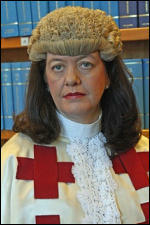 Lady Wise also noted that a central part of the reasoning for refusal of the petitioner’s article 8 claim so far as her grandson was concerned was stated as being that she did not have parental responsibility for him, but the judge observed that the petitioner was one of the boy’s “primary carers”. She said: “I conclude that the statement that the petitioner does not have parental responsibility for the child is at best inaccurate and misleading and fails to address the particular role played by her in the life of a child whose interests are specifically recorded as relevant to the immigration decision. In my view it was an error to place reliance on that inaccurate and misleading statement in concluding that the petitioner’s removal was not disproportionate on article 8 grounds. “I consider also that there is some force in the criticism made by counsel for the petitioner that the decision letter lacks balance by emphasising only what might be regarded as adverse factors, rather than weighing up the circumstances that might invoke the protection of article 8 against those adverse factors. Lady Wise added: “I conclude that even reading the decision letter as a whole it does not address that issue in a way that faces up to the petitioner’s central role in the child’s life. Had the petitioner’s role as primary carer to the child since his birth been properly factored in, it might have led to a different conclusion. Accordingly, the error identified is sufficiently material to vitiate the decision to certify the claim.